Drill bits are mainly used to obtain the solid material of the holes 5 accuracy classes and 3-4 classes of surface finish and less for enlarging or reaming the hole previously obtained and beveling in it. In certain cases, drills are used for hole shaped profile. depending on the design of the working part of the drill can be divided into the first, which, thanks to the simplicity of design of the working part are used for obtaining small diameter holes (mostly up to 3 mm) and hole shaped profile, and also when drilling deep holes, and holes up to 10 mm in plastics; spiral with the right and left direction of the chip grooves, ensuring good chip evacuation from the cutting zone in a certain direction; drill for deep hole drilling, applied mainly at the drilling depth is equal to or greater 5-10 diameters of drill, and often have special channels for supplying a pressure of 5-10 ATM of coolant into the cutting zone. Combined and special drill was the most widely spread. 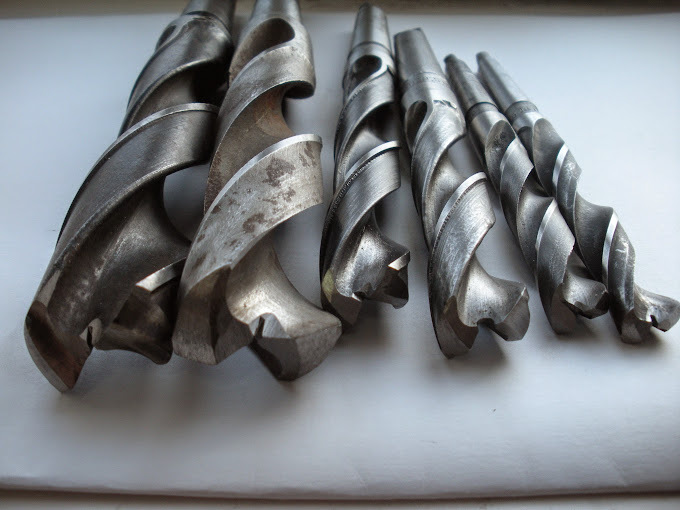 For example, conventional twist drill bits in some detail consider the main provisions for the appointment of dimensions and constructive elements. the nominal diameter D is taken depending on the purpose of the drill taking into account of the breakdown of the hole and usually has a negative tolerance. For example, tolerance for drill diameters from 6 to 10 mm is 36 microns, and diameters from 50 to 80 mm to 74 microns, etc. Core drill determines its strength and stiffness, and therefore it must have a relatively large size. However, excessive increase leads to a decrease in the volume of the chip flute, as well as to increase the length of the transverse blades (jumpers), which complicates the cutting process. Based on the above, the core diameter is usually set depending on the nominal diameter D of the drill. to increase the strength and rigidity of drill core diameter increases as it approaches the shank of 1.7-1.8 mm for every 100 mm length of working part of the drill bits from high speed steel and hard alloy, and drills of carbon steel and alloy tool steel is 1.4-1.5 mm. Cylindrical ribbon PA working part should provide sufficient direction to the drill and at the same time not to be very wide to prevent a strong friction on the surface of the hole. Usually the width b and the height h of the ribbon are dependent on drill diameter and workpiece material. So, for standard drills with a diameter from 6 to 60 mm they are equal to B = 0,54-2,6 mm and h =0.2 to 1.2 mm, and the processing of plastics the width of the ribbon is recommended to be reduced compared to the standard drills of two to five times. Drill diameter less than 0.5 mm are usually performed without the ribbon. Reducing friction of the working parts of the drill surface holes is achieved by grinding the ribbons not along the cylinder and with reverse cone. Thus, the diameter of the drill decreases toward the shank by an amount of from 0.03 to 0.10 mm per 100 mm length of working part, which provides support angle. the value of the inverse taper, and the width of the ribbon depends on workpiece material, diameter, depth and precision drilled holes. Thus, when drilling deep holes with relatively low accuracy requirements implementation its diameter is recommended to increase the magnitude of the reverse taper than standard drill bits. Form flutes must provide sufficient strength of the drill and the space left for chips, as well as a favorable shape of the cutting blade provides a good cutting conditions and easy chip evacuation. Usually the width of the groove of the drill taken somewhat greater than the width of the pen, and is little more than a quarter of the perimeter of the drill. It should be noted that the width of the groove of the drill bit in the drawings generally is not affixed, and is set by profile shaped grooving cutter. 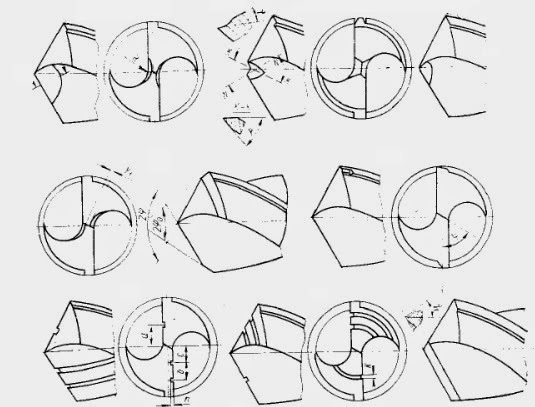 Settings for profile grooving cutters influence the diameter D of the drill, angles in plan and inclination of the grooves. Thus, changing one of these parameters entails the change of the parameters of the cutter. To limit the number of grooving cutters and given that small deviations from the theoretical profile of the groove will not affect to a large extent on the performance of drill bits, made a limited number of profiles grooving cutters for the entire range of diameters of drill bits used. As is known, the design of the twist drill has such organic deficiencies, as the small size of the front corner points of the main cutting blade located about the transverse blades, and the negative value of the angle y in fact, the transverse blade; no back corner on the ribbon 3, it is difficult approach the coolant to the cutting zone and a number of other deteriorating conditions of the tool. in order to address these shortcomings and improve the performance properties of drill bits currently widespread Potocki or sharpening of the cutting part of the drill. the Standard gun nose cross blade — jumper carried out by reducing its length and some increase in the front corners at the points of the cutting blades, attached to the transverse blade, allows to reduce the axial component of the cutting forces Ro to 25% and increase tool life by 1.5—2 times. the Decrease in axial force of Ro in 2-3 times, torque 1.5—2 times increase minute resistance ГМ1Ш 2 or more times can be achieved by Potocki transverse blade in which a cross blade is cut with an abrasive. With the gun nose of the jumper the other method on the transverse blade sharpened small indentations that form on this positive angle. Double sharpening is used for drills with a diameter above 12 mm and is transient sharpening of the cutting blades under 75° on a length of 0.2/9. The use of double grinding allows for the improved heat dissipation and increasing the active length of the cutting blades to increase tool life when machining steel 2-3 times, and the processing of cast iron from two to five times. the Reduction of friction at the ribbon, and increasing resistance to two or more times the drill diameter more than 10 mm can be achieved by Potocki ribbon which is to reduce the width of the ribbon f = 2.6 mm to f = 0.2-0.3 mm in length h = 1,5-4 mm adjacent to the tooth tip drill bits by sharpening the auxiliary angle of 6-8°. the division of the chip width is achieved by obtaining stroiarsenal grooves are staggered in the front or back surfaces of the tooth. Forced chip breaking during drilling is achieved through the performance of special sills and ledges, PA front surface of the drill. improved tool life and productivity in drilling normal and especially hard materials can be achieved through the use of twist drills of high speed steel and hard alloy with laminated directly to the feathers of the tool holes for supplying a coolant. In this case, the drill is mounted in a special cartridge. 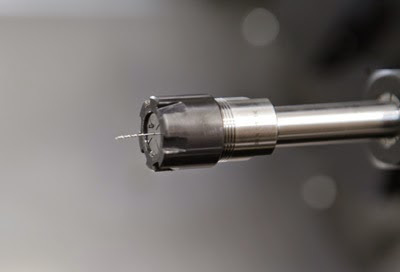 Cooling liquid pressure of at least six atmospheres and a flow rate about 12 l/min through the hose through the cartridge is supplied through the drill directly to the cutting zone. Auger drill bits with cylindrical and tapered shank allow drilling up to a diameter of 20 mm and a depth of more than 30 diameters without periodic output of the tool for chip removal from grooves. The special groove profile and the angle w = 60°to ensure reliable chip evacuation from the cutting zone. So, a drill with a diameter of 14 mm is provided by drilling holes in the cast iron to a depth of 500 mm in a single pass. the Diameter of the core from the auger drill is 0.35-0.4 of the diameter of the drill and has no taper. Sharpening drill bits is made in the front and rear surfaces. When drilling holes in cast iron take a 118° angle and the front angle and rear angle OS is equal to 12°. it Should be noted that with increasing depth of drilling torque in this case increases only slightly. The value of the maximum flow when drilling screw drills assigned from the condition of straightness of drilling and stability of the drill from buckling and not from the strength condition, as the drill bits of conventional design. to Improve performance for conventional drilling and hard materials can also be achieved through the use of drills, equipped with hard alloy. So, the introduction of one-piece solid carbide and brazed tools when machining steels, stainless and heat resistant steels and alloys allows for comparison with tools of high speed steel R18 to increase the resistance of 10-50 times or more. In this case, the following options equip the drill with a diameter of 10 mm solid alloy. Drill diameter 3 — 6 mm can be run entirely from a solid alloy, and the diameters of 5-10 mm composite drills with working part of hard metal, is soldered to the shank of structural steel. In turn, the drill diameter of 0.8 to 6 mm can be made solid with grooves rubbed out.